Today is, of course, Talk Like a Pirate Day. On September 19, geeks the world over begin to talk, write and code like pirates. Those misguided folks who identify instead with ninjas have no day, since ninjas are known more for their stealth that their colorful language. Being a PieRat myself, I have no official day (yet). And my language, while frequently colorful, includes more instances of “canonicalization” than “argh” or “shiver me timbers.” All the same, I do adore Talk Like a Pirate Day. These are just a few of the ways I celebrate this and every piratical day. 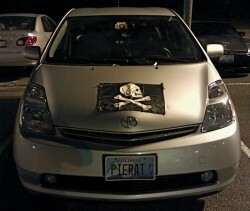 Me ship: The PieRat Prius. 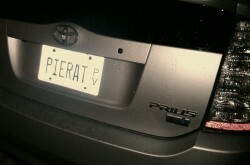 Known for a short while as Tortuga (Spanish for “turtle” and also the island of piratical gluttony in “Pirates of the Caribbean”), when we moved to Illinois I gave it a PieRat vanity plate. Ironically, it’s also a special “Prevent Violence” plate with a dove on it, the funds from which support programs that prevent violence in Illinois. 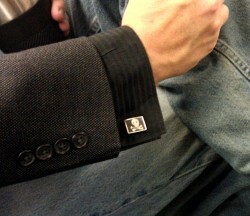 Blackbeard would not be impressed, methinks. 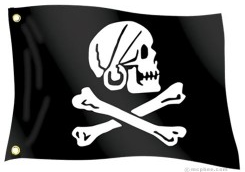 Me flag: I sail under Henry Every‘s Jolly Roger. It’s less aggressive than the front facing skulls and I didn’t want to scare my daughter who’s a bit squeamish about skeletons. Plus there’s the nice earring and do-rag. Tres chic for a pirate. I did try to fly this flag from my antenna, but sadly me mizzenmast wasn’t man enough to handle the drag. 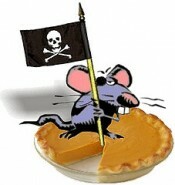 The next bilge rat to 302 walks the plank! 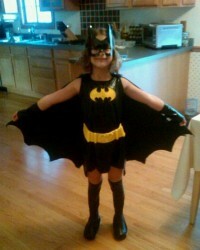 Me proud beauty: Hazel rather prefers Batman to pirates, but at least it’s the right colors. I’ll have to keep working on her. 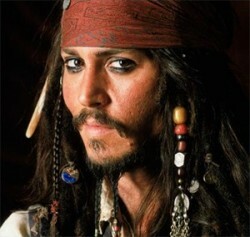 Me favorite celebrity pirate: I know it’s trite, but I do love Captain Jack Sparrow. The worst pirate you’ve ever heard of … ah yes, but you have heard of him. Is there anything Johnny Depp can’t do? Me favorite drink: Mint cucumber cooler with rum, of course. But really anything goes with rum — lime coke is quite nice, any juice. I’m not so much for swigs from the bottle, thank you. Of course I do like a nice bottle of red, and I’m a sucker for girltinis. Cosmo anyone?